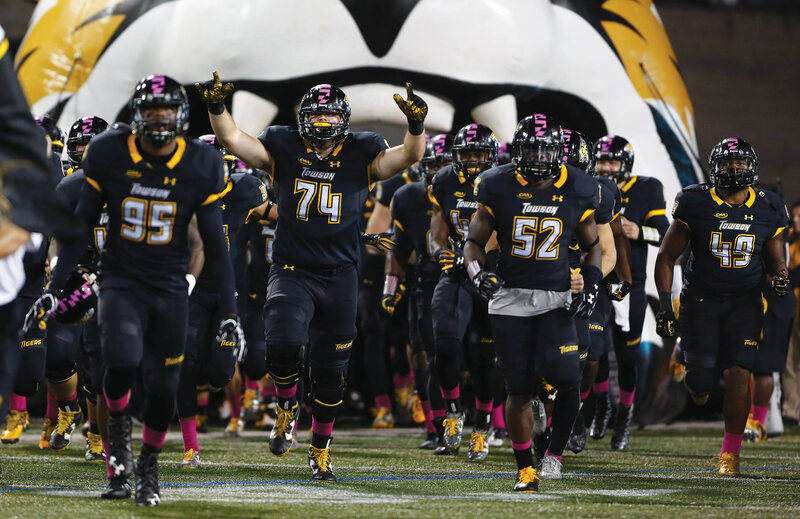 Despite going into halftime with a 10-point lead, Towson dropped its third straight Colonial Athletic Association (CAA) game Saturday at Johnny Unitas Stadium against Stony Brook. The Tigers (1-4, 0-3 CAA) fell behind the Stony Brook Seawolves (3-2, 2-0 CAA) 7-0 late in the first quarter when redshirt junior running back Stacey Bedell rushed for a three-yard touchdown. 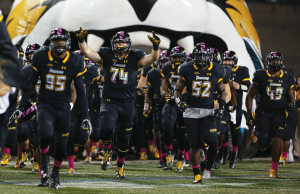 Towson responded on its ensuing drive to tie the game 7-7 when redshirt sophomore quarterback Ellis Knudson hit senior wide receiver Andre Dessenberg in the corner of the end zone for a touchdown. “When it was working, it was the offensive line to the quarterback, to all the receivers to the running backs blocking and everything,” Dessenberg said. In the second quarter, Towson took a 10-7 advantage and its first lead of the game when freshman kicker Aidan O’Neil put a 23-yard field goal through the uprights. Towson’s scoring drive was sparked by a 24-yard pass from Knudson to redshirt sophomore wide receiver Sam Gallahan, which put the team in field goal range. The Tigers extended their lead to 17-7 before the end of the half, after an eight-play drive that was capped off with a two-yard touchdown pass from Knudson to senior tight end Tanner Valley. In the second half, Stony Brook cut Towson’s lead to 17-14 on an eight-play, 91-yard drive that was capped off with a 12-yard touchdown run from sophomore quarterback Joe Carbone. Just 22 seconds into the fourth quarter, the Seawolves took their second lead of the game with a touchdown run from sophomore running back Jordan Gowins. Following Stony Brook’s scoring drive, Towson had the opportunity to tie the game 20-20 after driving into field goal range. However, a failed quarterback sneak on fourth down gave Stony Brook the ball back. After a defensive stand from the Tigers, Knudson threw his second interception of the game, giving the Seawolves the ball at the Tigers’ 25 yard line. The Seawolves took advantage of the Tigers’ mistake and went ahead 27-17 on a 23-yard touchdown run from Bedell. Towson made it a one-score game on its next drive, when O’Neil knocked home his second field goal with 3:44 left in the game. The Tigers caught their break on the ensuing kickoff when Seawolves junior wide receiver Sherman Alston Jr. fumbled the ball, and Tigers defensive back Keon Paye recovered. However, the Seawolves held the Tigers and forced a turnover on downs, running the clock out to secure a victory. Towson will play its final non-conference game of the season when the team travels to Hanover, New Hampshire, Saturday to take on Dartmouth. Kickoff is scheduled for 1:30 p.m.